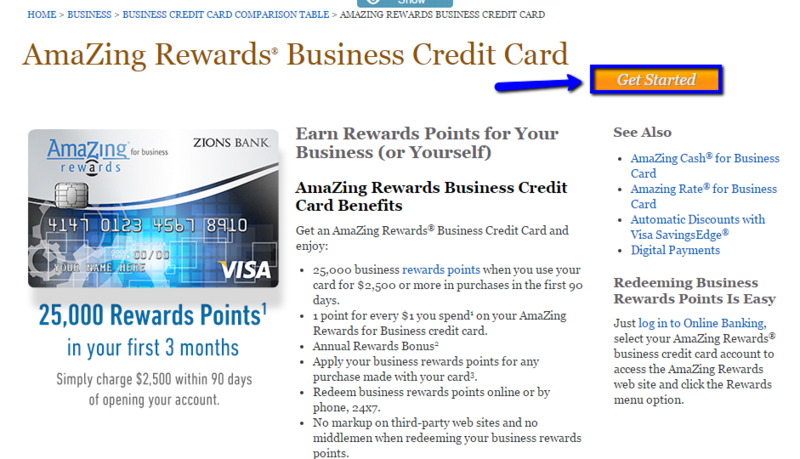 Zions Amazing Rewards Business Credit Card is the best option for those, who prefer saving money while doing business. In order to apply for this card, you have to print an application form and drop it in the nearest Zions location. So the instruction we have prepared will show you how to fill your application form and how to apply in person. As we have mentioned before, there is no way to apply for the card online. But we will show you how to download the application form, how to fill it and how to apply in person. Step 1 – First of all, you should visit issuer’s website and click ‘Get Started’ button. Step 2 – You have a possibility to save your time, completing the application at home. So click ‘Download Application’, save it on your computer and print. Step 3 – Select your credit card type from the list. At this time choose ‘AmaZing Rewards for Business (Points)’. Request the credit limit you would like to get and go to the next step. Step 4 – Enter the Legal Business Name, Tax ID Number, Business Phone. After that provide Business Address and Mailing Address (if it is different from Business Address). Provide all the financial information required and fill all the fields, marked in blue. Step 5 – You have to write down your Company’s Name again and provide Authorizing Officer Names. Write down Title and Date as well. Step 6 – If you represent a non-profit company, you don’t have to fill this form. But if you’re not – please, provide at least 3 Guarantors and all the information about them. 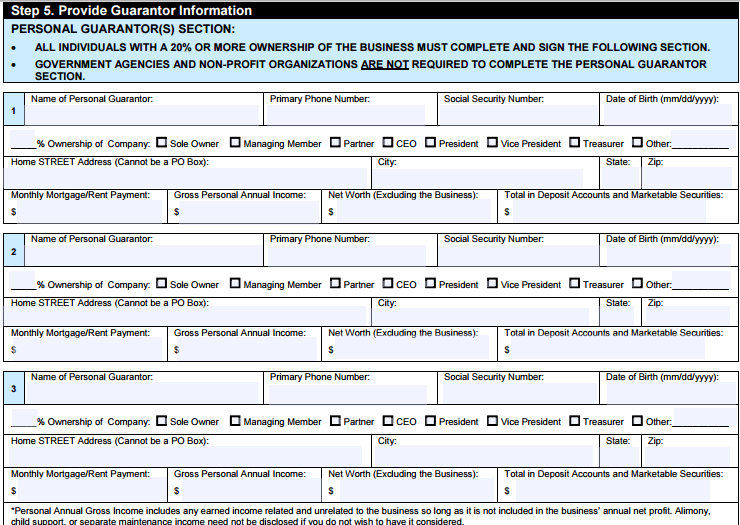 Step 7 – Read the Agreement and make your Guarantors sign it. After you’re done, go to the next step. 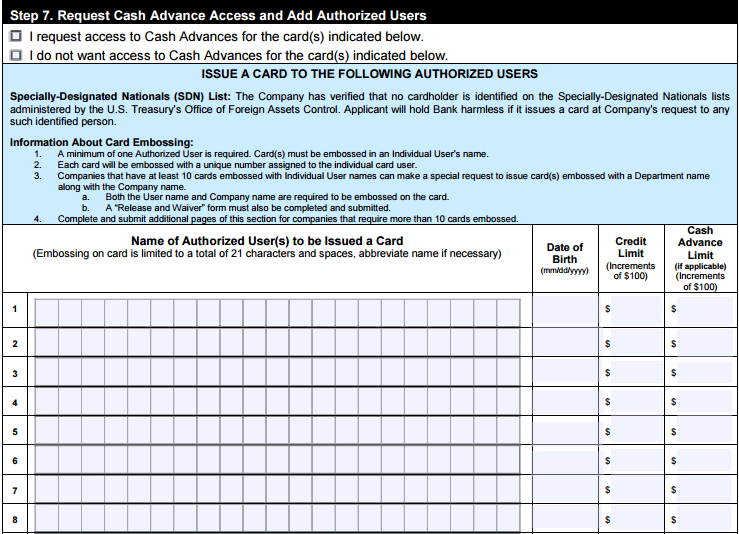 Step 8 – To finish your application process, you can request access to Cash Advances for your Card. If you don’t want it – press ‘I do not want…‘ button. Also, you can add up to 10 Authorized Users. Q: What should I do to find out whether my Visa Business Credit is eligible for Visa Savingsedge? All you need to do to find out the eligibility of your Visa card is to you enter your Visa Business card number when enrolling, and Visa will verify your card's eligibility and send you the feedback. But it is good to know that eligible cards include Visa Business credit cards, Visa Business Platinum credit cards, Visa Business check cards, Visa Business Platinum check cards and Visa Business Signature cards. Q: Am I eligible for auto rental collision damage waiver if I possess Zions AmaZing Rewards Business Credit Card and what is not covered by it? Yes, as a holder of a Visa card, you are eligible for auto rental collision damage waiver. That is optional damage insurance coverage which is offered to you when you rent a car and it represents a protection which limits how much a car hire company can claim from the renter, if certain parts of the rental car were damaged while he/she drove it. What is not covered by collision damage waiver depends on a car hire company. But, you should know that the bodywork of the car and the engine is definitely covered, unlike windows and mirrors, wheels and tires, interior of the car, flat battery, lost keys and additional equipment.